Gear up for an exciting foray into Southeast Asia’s new metropolis of cool — Bangkok attractions seamlessly blend the contemporary with the traditional. 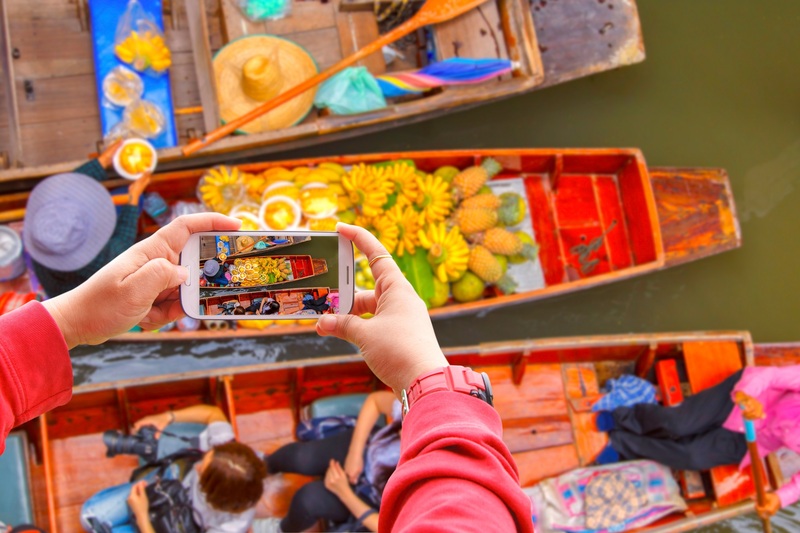 Bangkok attractions range from international brands and mega malls to bustling markets, lip-smacking street food, and pulsating cityscapes. And all of these within a few hundred meters of the famed golden temples in Bangkok. 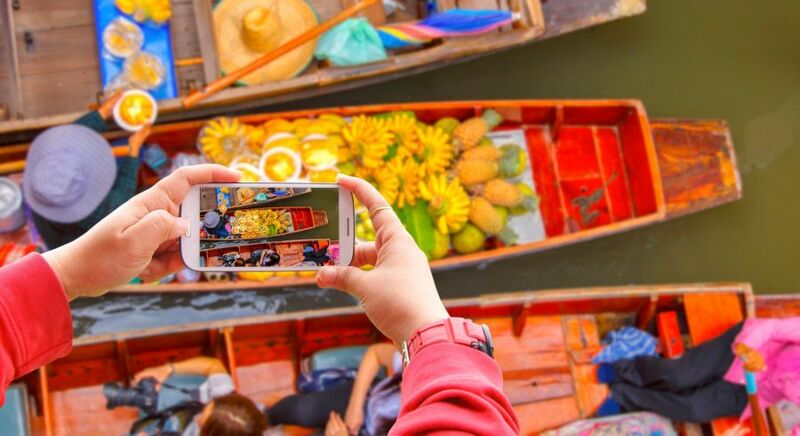 One of the most visited cities in the world — over 21 million people traveled here in 2016 — Bangkok is Asia’s cool new metropolis that seamlessly blends the traditional with the contemporary and allows travelers to re-imagine it every time. 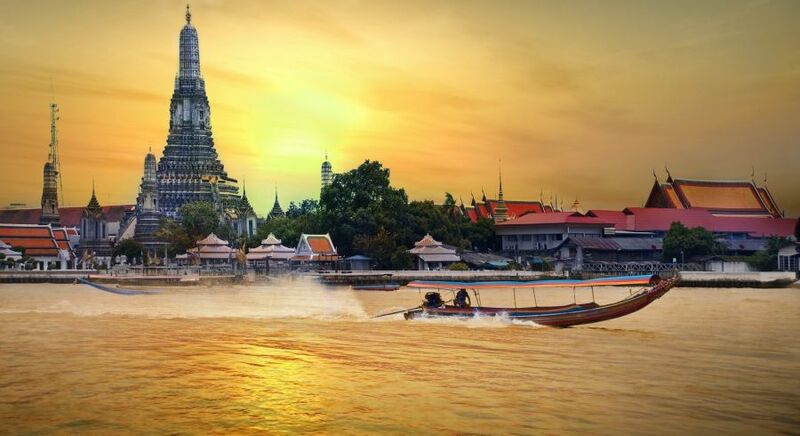 To help you decide on the things to do in Bangkok, we bring you the best of Bangkok attractions: the impressive Grand Palace, wats or temples, traditional souks and night markets, irresistible Thai street food, and terrace restaurants at dizzying heights. The pinnacle of Thai religious art, Wat Phra Kaeo, looks like a lavishly designed stage set. In the cool precincts of the temple sits the Emerald Buddha on a nine-meter-high pedestal, carved from a single piece of jade, snug in his immaculate golden attire. Walk over the ancient flagstones and take in the splendor of the beautiful murals on its arcade walls and roofs. Fear not the gaze of the 6 meter-tall imposing demons watching over the Emerald Buddha — they are protectors who ward off evil spirits. 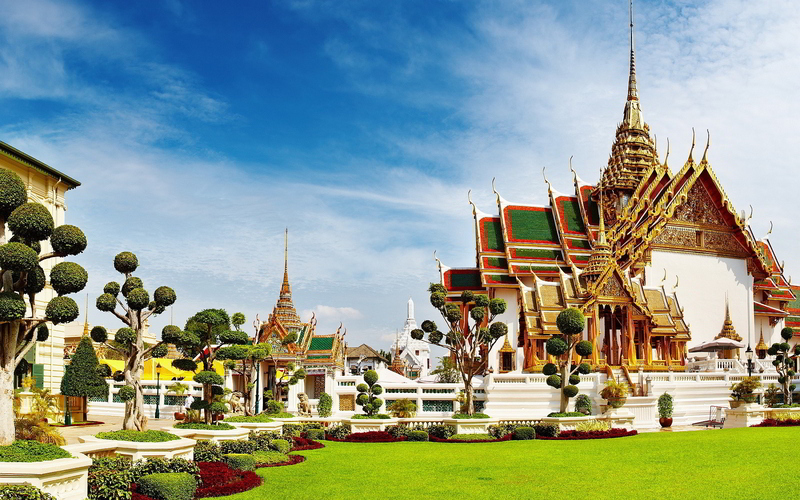 No visit to Bangkok is complete without witnessing the magnificent Grand Palace. No visit to Bangkok is complete without witnessing the magnificent Grand Palace. Built in 1782, the Palace served as the official residence of the kings of Siam (now Thailand) for over 200 years. The Palace is designed in a highly asymmetric and eclectic style, as it was developed organically by successive reigning kings. Its many structures, varying in architectural virtuosity, include eight Prangs (temple towers), a golden shrine, a royal pantheon, a jeweled wall, pavilions set in open lawns, gardens, and courtyards. 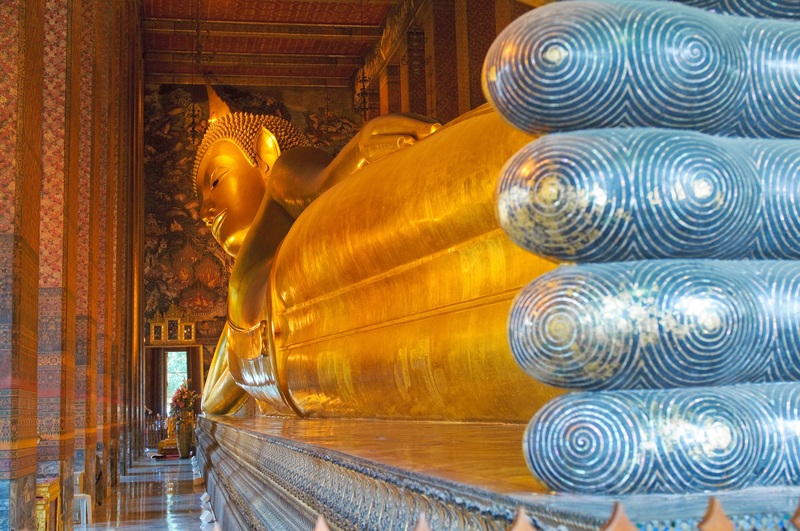 A 10-minute walk from Grand Palace will bring you to Wat Pho, the home of the famous giant reclining Buddha. He is clad in gold leaves, with huge feet inlaid with mother-of-pearl. It seems as if his 46-meter length has been squeezed into the building. 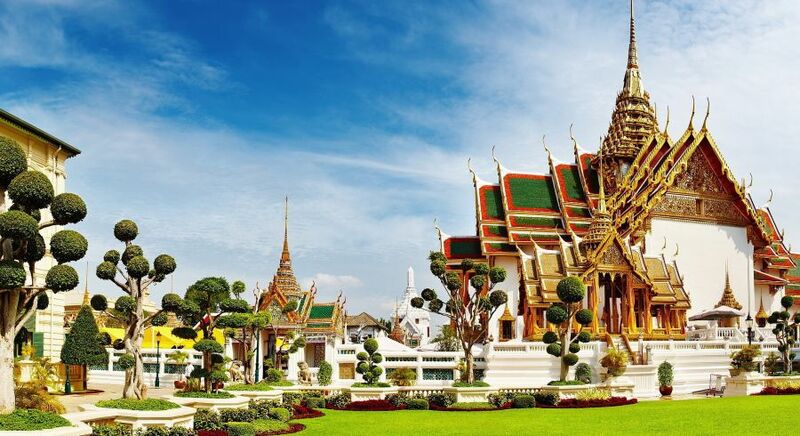 Check out the four chapels on the temple grounds, the 394 gilded Buddhas from different parts of Thailand, and the 91 chedis — hemispherical structures embellished with ceramic flowers and colorful tiles. And while you’re here, get a traditional Thai massage. Yes, you read that right. The temple grounds houses one of the most renowned massage schools in Thailand. You can also extend the experience by signing up for a multi-day course. 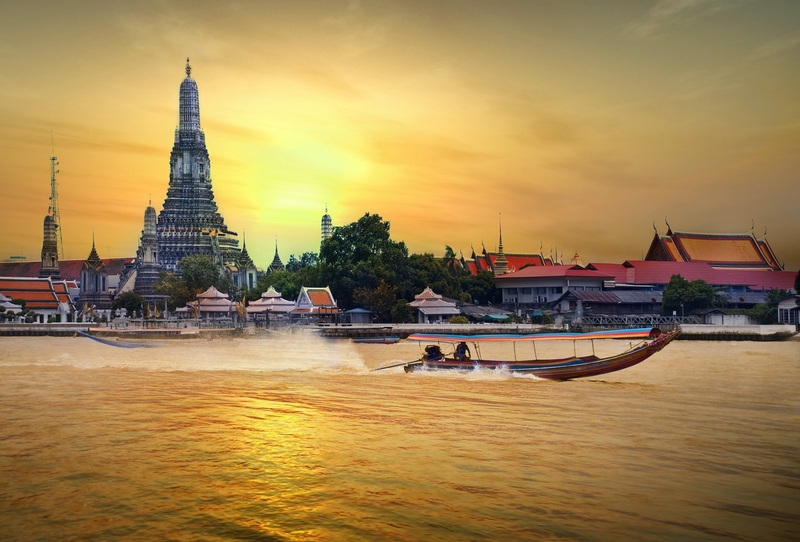 Wat Arun or the Temple of Dawn is the most photographed temple in Bangkok. You will know why if you get here early and watch the first rays of sunlight reflect off its surface with pearly iridescence. Climb atop the 80-meter-high Phra Prang (central tower) and you’ll be rewarded with a great view of the Royal Palace, the skyline and the meandering Chao Phraya river below. In the evening, take a boat ride and admire the Temple of Dawn from the river. It dazzles in the luminescence of the tiny pieces of colored glass and Chinese porcelain that adorn its soaring central tower. One of Bangkok’s most vibrant neighborhoods, the sights, sounds, and smells of Chinatown or Yaowarat are a veritable assault on the senses, but for all the good reasons. 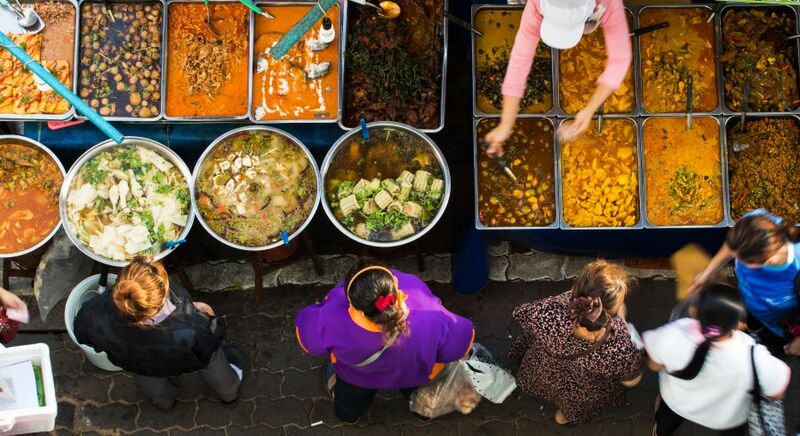 Let your taste buds savor the spicy, sour, sweet, and salty flavors of regional Thai food such as grilled seafood and Pad Thai — a stir-fried rice noodle dish spiced up with chilies, tofu, tamarind and fish sauce, as you discover temples and everyday street scenes begging to be captured on camera. Read our Bangkok restaurant guide. The Khao San Road is a noisy circus of activity, aromas, and colors. From lively bars and massage parlors to tattoo shops and street performers putting up ping pong shows, you will find it all here. Despite its reputation as a backpacker’s mecca, all kinds of travelers throng the place as it offers great street food and late-night revelry. Food hawkers sell barbecued insects and other exotic snacks here, apart from regular Thai fare. Khao San has historical links to the rice trade in the region — the words ‘khao san’ mean milled rice. 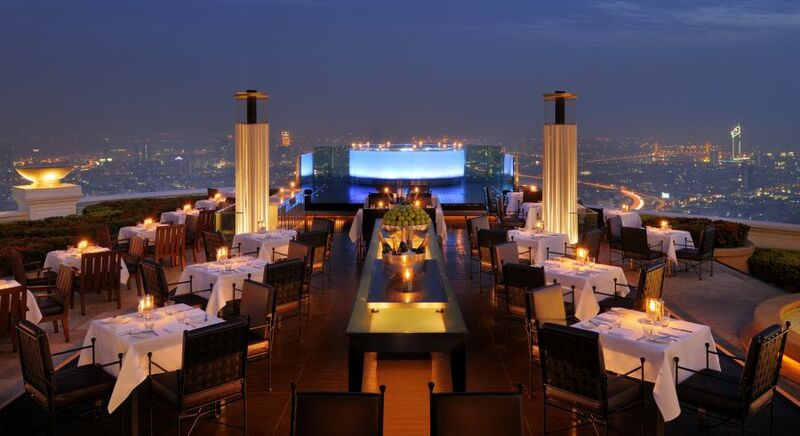 Not many cities in the world boast as many rooftop bars as Bangkok. Party late into the night as a million lights sparkle below and the stars shine above. Lounge about and sip on cocktails at dizzying heights as you take in a sweeping 360-degree˙view of the city from the Vertigo and Moon Bar at the Banyan Tree Hotel. Not many cities in the world boast as many rooftop bars as Bangkok. Do check out Skybar on the 63rd floor of the Lebua Bangkok State Tower, which has hit the limelight since it was featured in Hangover 2. 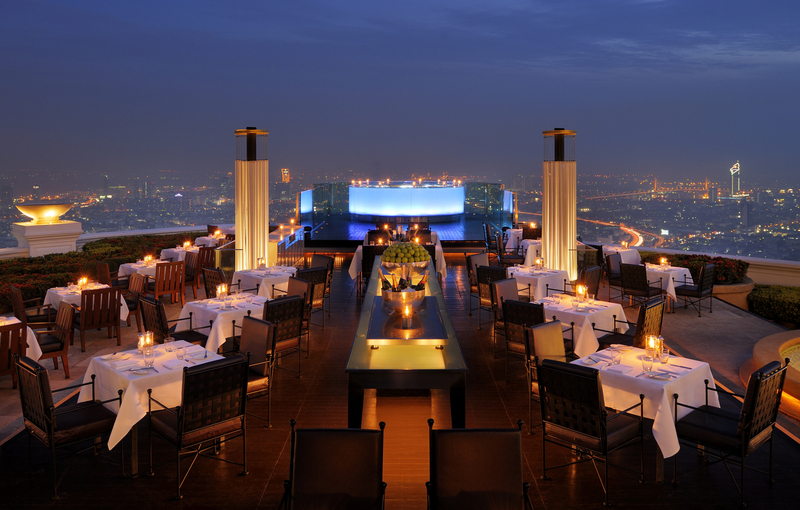 At Sirocco, one of the best sky-high restaurants in Bangkok, order cocktails with cool names such as Gravity and Genii in a Bottle. You must also try the Chef’s Tasting Menu, which includes innovative dishes such as rock shrimp served with a citrusy Yuzu-marinated apple and avocado gazpacho. Wrap up on a sweet note with the Mont Blanc Sphere — a sensuous amalgamation of Marron confit (a glazed chestnut candied in sugar syrup), caramelized pear, Chantilly, and white chocolate mousse. Bangkok’s open markets with their maze-like alleys have shops selling everything from trendy fashion accessories and knock-off kitsch to farm-fresh flowers and agricultural produce. 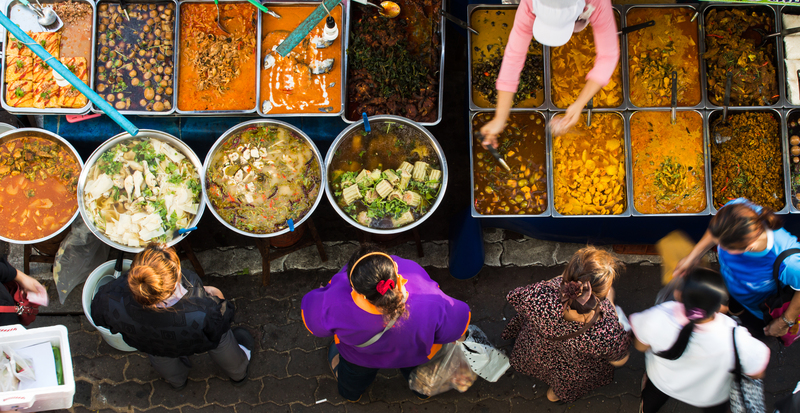 Alongside excellent bargains, the markets offer a carnival-like atmosphere with bars and live music and the opportunity to sample the best of Thai food — papaya salads, oyster omelets, sour Isaan sausage, flat noodles in a pepper broth, roasted chestnuts and more. In Talad Red Fai Ratchada, you can find stylish clothes, colorful vintage stalls and trendy bars in converted VW buses. Or take a boat ride through Bangkok’s Klongs (canals) to check out one of its floating markets. On the weekend, shop till you drop at Chatuchak, the mother of all street markets with over 15,000 shops. 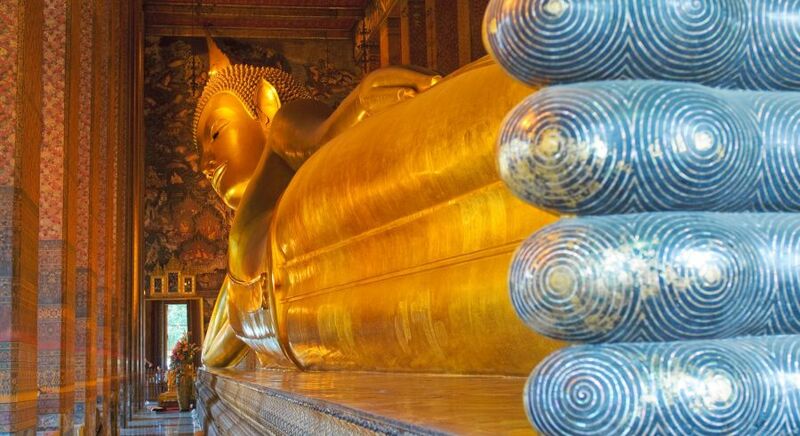 Aside from Bangkok, here is our list of a host of other things to do in Thailand. To visit the City of Angels and check out these Bangkok attractions for yourself, call us and we will plan a tailor made Thailand vacation for you. Well written article. Have visited Bangkok twice. Temples and specially Emerald Budha my favourite palace of visit. Just in time!!! About to leave for Bangkok next week. Very informative article. Keep it up. Will be great to get some information about other South East Asian and other countries . Keep it up!! A must read article for all the tourist planning for a vacation to Thailand. Aru muy buen artículo me encanta. Eres muy talentosa.